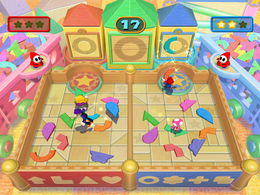 World Piece is a 2-vs-2 minigame in Mario Party 7. Its name is a pun on "world peace"
In this mini-game the two teams are placed in two small, separated arenas. A shape will appear in the center of the room, and the two teams must race to match up the shape with two smaller halves. These half-shapes are scattered around the two arenas, and each team need to grab the correct ones and put them into the large panel at the far end of their arena. When a team does this, they get a point. The first team to earn three points win the minigame. Rules – "Combine 2 shapes to make the shape in the center of the board. The first team to 3 points is the winner." Advice – "Each shape is composed of 2 halves. If you pick up the wrong shape, you will lose valuable time." This page was last edited on August 5, 2017, at 11:57.